After the underwhelming previous episode, Stealing from the Elderly feels like a return to RWBY’s roots. After the previous couple of episodes of RWBY being fairly slow, Stealing from the Elderly takes a break from clunky writing and swaps it out for some of the classic action, making for the most exciting episode in the volume so far. Stealing From The Elderly opens up with at the Atlas military base, with Weiss being escorted by Cordovin and her lackeys, along with Saphron carrying Adrian. 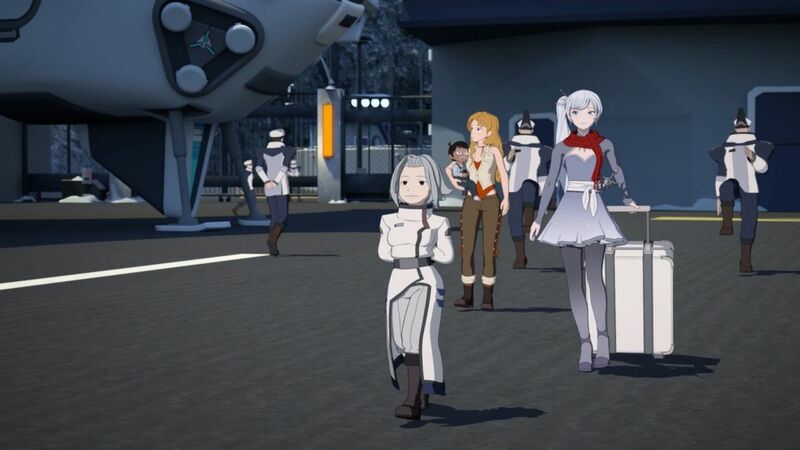 While Cordovin comments on how pleased she is that Weiss is returning home, the lackeys go to help her with her suitcase, pointing out how heavy it is. As Cordovin begins to look suspicious, Adrian starts crying out loud, bringing the attention to consoling the baby while Weiss boards one of the ships, where the audience finds out that Maria is actually in the suitcase, disgruntled at the guards calling her heavy – it’s hard to imagine how the team convinced her to do it, but it makes for a pretty amusing discovery. Weiss picks up her scroll and calls Ruby, telling them they’ve boarded. Ruby tells the rest of the group to keep an eye on their scrolls, explaining that as soon as Weiss is out of range of the comms tower, she’ll also be out of range of the military’s radar. Meanwhile, Yang and Blake are speeding towards the radar station on Bumblebee, with Blake on her scroll to Tara about how the radar should be easy enough to shut down as it runs on a separate system to the rest of the city’s communication systems, with Blake joking about how this isn’t the first time that she’s disabled Atlas security – not the smartest comment to make to someone who works in part for the military, but there you go. As Yang and Blake pull to a stop and Yang asks her if she doesn’t need the extra help, Blake makes a comment about how stealth isn’t her strongest point, quickly correcting herself by saying Yang’s great and she’ll hurry back. Queue the shipping fan’s hearts melting. The rest of the group look pleased with themselves that the plan is working so far, with the exception of Qrow. As Weiss’ airship speeds away, she notices that the signal on her scroll is gone, making her go to the cockpit and commandeer the airship, with the lackeys making the joking comment that ‘this parachute you’ve given us won’t excuse you of your treachery’ as they are thrown from the ship. This pair were a funny duo in the short time they had in the show, and hopefully they’ll make a reappearance further down the line. As Maria and Weiss go back into the cockpit with Maria piloting the ship, Weiss worriedly asks if Maria could fly the ship, with her pleasantly replying ‘what part of greatest huntress of our generation do you not understand?’. When Weiss further goes on to make a comment about her eyes needing repaired, Maria cuts her off, with a now worried Weiss buckling into her seat. As the rest of the group worry about what has happened with Blake and why the radar is still up, Yang simply replies, ‘keep the ship in one piece’ and drives towards the radar. As Nora suggests helping Yang and Blake first, Qrow snaps, pointing out that they’ve maybe got ninety seconds before Cordovin’s fighters are on Weiss and Maria, blaming his bad luck semblance and the decisions he’s made to get up to this point. However, Ruby replies by saying that all they can do now is the best they can and that they would have come whether Qrow allowed them or not, but they could still use him by their side. The episode cuts to the radar station, with Blake having abandoned her scroll and running for her life, where it is soon revealed that her hidden assailant is actually Adam Taurus, who hasn’t been seen since the beginning of the volume. Blake at first tries to run to her life, only to enter a fast and brutal sword fight when that fails. Adam outragedly asks Blake why she had to come into his life and ruin everything, with Blake replying she wants nothing to do with him and that he was the one who stalked her across the continent. As the fight continues, the two fall into the forest below. As they both get back up, Blake offers Adam a chance to go, with Adam telling her ‘I let you go once already, Blake. I am never making that mistake again.’ ‘Stealing From The Elderly’ concludes with the two on guard, ready to strike. 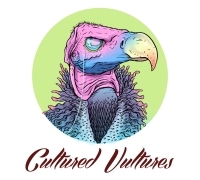 While the previous episode was mediocre, ‘Stealing from the Elderly’ feels like a different beast altogether, filled with well-done comedic writing and action sequences that haven’t really been seen in the last couple of episodes. It also felt longer than it actually was: despite only having a running time of fourteen minutes, making it one of the shortest episodes in the volume, there is so much going on, with the previous dialogue heavy episodes being replaced with action intense sequences. The dialogue seems to have been reworked as well, flowing a lot more than previous clunky pieces. While the reveal of the mecha is nothing short of awesome tension, the actual design of the mecha isn’t anything particularly unique, especially when compared to previous designs, like the Spider Droid in Blake’s trailer or the Athlesian Paladin in Volume two. It actually looks more reminiscent of a jaeger from Pacific Rim but seeing how RWBY will take it down will be interesting. While Qrow seems to still be going through his man-child phase, it looks like there is a strong potential for the scythe-wielding badass making a return. Though the show has a habit of leaving each episode at cliff hanger, this is definitely the most exciting conclusion, with the promise of more action before the volume is over. Without a doubt, ‘Stealing from the Elderly’ is the strongest episode this volume – ironic since it follows up what was arguably the weakest – and will leave audiences begging for more. ‘Stealing from the Elderly’ feels like a return to RWBY’s roots, with laugh-out-loud writing along with action that will leave audiences hyped.